Yes, subject to seat availability at a particular centre. At what age will my child be eligible for admission in each level? The earliest age is 10 months for a toddler and the highest is 4.9 years for Senior KG. Is it necessary to apply and secure admission much in advance? Since we are a reputed institute located in quite a few areas, most of the time our forms are sold in advance. Thus, it is better to apply and secure admission in advance so that you are ensured a seat. better than average when he/she joins a local school in Grade 1? Yes; our pedagogy ensures that your child achieves their best in all learning areas. Most of our children have got admission into top schools like Ecole Mondiale, Dhirubai Ambani School, Jamnabai, etc. What is the teacher-student ratio in the classroom? 1:6 in playschool, 1:8 in our nurseries and 1:10 at our Jr. /Sr.KG levels. You have a big outdoor area in all centres. Is outdoor-play supervised at all times? Yes. We have cameras, teachers and ‘Didis’ always around to supervise. How often are there parent-teacher meets? Parent-teacher meets are once every three months. Can I enrol my child only in day care? 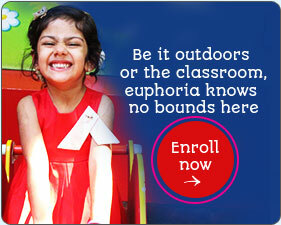 Yes; you can enrol the child only for day care should you choose to. 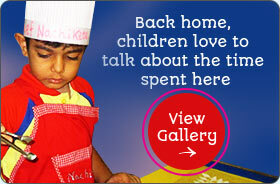 Why should I choose Alphakids over other preschools in the neighbourhood? Alphakids international has been an established preschool for the last 8 years with high quality staff, teaching equipment and curriculum. It’s a home away from home for the children with trained teachers who personally look into every child’s needs. Most of our teachers have been with us for over 7 years. It has stability, ensures safety, hygiene and an international standard curriculum. Over and above it is our own proprietary pedagogy “Asteria”, which assures your child will enjoy while learning. pay the initial fees for admission and provide your child’s birth certificate. What are the qualifications and experience of your teachers? All our teachers are ECE qualified graduates. In fact, Alphakids International is the only preschool where all our staff is certified under the Asia College of Teacher Training. How will my child be safe in your centre? we have a lot of safety precautions and protocols in place at each centre. What are the timings of the centre? The timings of the centre are from 9am to 5pm. Is your school affiliated with big schools? Not officially. However, our preparation helps ready your child for entry into bigger schools. Can we have access to the cameras on our phone? Very soon you will have the access to our cameras; as of now, the system is unavailable. Do you’ll have a doctor on call in case of emergencies? Does the school have a pick up and drop facility? pick up them up, for safety reasons. What activities does a day care child do? to creative writing and even home work. Can we get a planner for day care? Till what age do you take day care children? Up to 7 years old. Yes. We have a nutritionist and a cook in-house. We provide nutritious and healthy meals. In fact, this is one of our strongest USPs, besides our pedagogy. My child does not eat at home so I’m concerned about my child eating in school? but in case they don’t, then the teacher personally sits with the child and will feed them. What business qualifications does ALC look for in its potential preschool franchisees? A well-educated business person with a passion toward education and children. If you are planning to start an Alphakids International preschool, the investment would be in the range of 25 to 30 lacs. To start a Bellwether International School, the investment would be in the range of 3 to 4 Crores, in the initial few years, excluding the land. How much working capital is required in addition to the investment? For Preschool 25-30 lacs includes working capital and for High school 3-4 Crores would include working capital. What are the fees involved in the franchise and what is the franchisee fee payable? It depends on the location, area/district, potential student fee structure of that location and the state. franchise and what kind of location would be preferable? In terms of area, we need a minimum of 2000+ sq. ft., built-up, with a minimum of 4 rooms and one hall; preferably ground floor or ground+first floor. In terms of location, we need the property to be in a thickly populated residential area, ideally an independent house and or not near to (<500 mtrs) any hazardous places like petrol pumps, liquor shops and grave yards. How much space and area is required to start a Bellwether International school franchise? in case of a metro and 3 to 5 acres in case of tier 2 and 3 cities. To start with, we will need a carpet are of 30,000 sq. ft.
What kind of initial training and ongoing support& guidance will ALC provide? We provide support on recruitment, training, audits, marketing and complete operational support. What support do you provide to a franchisee? From the get-go we provide complete guidelines in terms of infra setup and readiness, staff recruitment. On an ongoing basis we provide enrolment support in terms of a marketing plan and its execution, adequate training and audits for teachers and quality compliance. for children and staff, aside from rewards and recognitions. How soon can I recover the capital invested? For Alphakids International preschool, the operational break-even is by the end of first year and the capital break-even is at the end of 3rd year. For Bellwether, the operational break-even is at the end of 2nd year and the apex break-even is at the end of 4th year. In some cases, due to high construction cost, it is at the end of 5th year. What are the profits I can expect to make? This portion is subject to your location, infrastructure and fees. An average profit ratio would be about 25-30%. to set up a high quality Alphakids franchise. Would it still be possible? Yes. Our team and support will help you achieve this. I currently own a preschool but I want to convert it into an Alphakids franchise. Yes. Conversion of an existing centre to Alphakids is very possible. We have certain criteria and once your existing centre meets those criteria, it can be converted. How soon can the school be in operation once I have been accepted as a franchisee? It purely depends upon the availability of suitability and its suitable condition. The average time it takes ranges from 1-3 months. and for High school, it should be 6 months prior. What is the application procedure to become a franchisee? You can fill up the enquiry from either online or by getting in touch with our sales executive. Once you have made an enquiry our staff will get in touch with you to understand your profile. Once your profile is screened and found to be suitable, then our staff will evaluate your location and the site/property. When the property and location is deemed suitable, our staff will visit your site and the vicinity to check the feasibility. If everything goes well then we get to documentation.